We previously explained the various elements in a typical balance sheet. Now in part two of our “Beginner’s Guide To Understanding Your Balance Sheet” articles we take a look at some of the ratios you can calculate to gain valuable insights into the financial position of your business. Solvency, or liquidity, is a business’ ability to repay its debts. There are simple ratios you can calculate to identify the level of solvency. Current ratio: divide current assets by current liabilities. Aiming for a minimum ratio of 2 to 1 (or $2 in assets for every $1 in liabilities), shows that a business is able to meet its short-term commitments without risking cash shortages or seeking additional funding. Quick ratio: divide current assets minus stock by current liabilities. This is a tougher measure of solvency as it omits stock with the theory that it is difficult to convert it quickly into cash. For businesses with a lot of stock on hand, aiming for a minimum ratio of 1 to 1 is recommended. A balance sheet can show whether a business’ financial position is strengthening or weakening by calculating the equity to assets (or ownership) ratio. 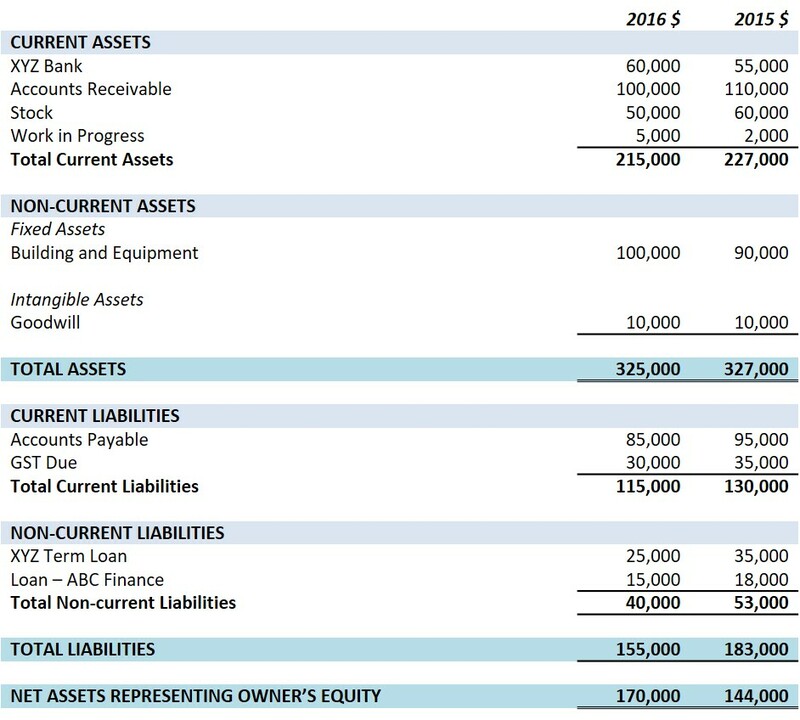 Dividing owner’s equity by total assets (less any intangible assets) shows how much of the business the owner actually owns. Aiming for a minimum ownership ratio of 40% can help avoid being undercapitalised and minimise the risk of having too much debt. Calculating the debt to equity ratio by dividing total liabilities by total equity will show the extent to which a business relies on debt to finance its growth. In very general terms, a high debt to equity ratio may indicate that a business has aggressively financed its growth with debt. On the other hand, a low debt to equity ratio may be a symptom of a business not taking advantage of increased profits for financial leverage. Although the balance sheet shows a static view of assets and liabilities, the movements around these are also reflected in income and expenses on the profit and loss statement. Financial statements are all related and work together to give a rounded view of a business’ financial health. Please feel free to contact us if you have any questions regarding your balance sheet or any aspect of your year-end accounts.